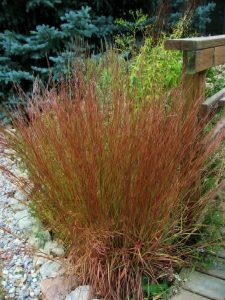 Little Bluestem (Schizachyrium scoparium) turns a beautiful shade of bronze in fall. I love the fall season. I love to watch the change in color of the warm season native plants — forbs, grasses, trees and shrubs. I’ve always known the change in color had something to do with the chlorophyll in the plants, but I thought it was about time I learned what happens to create the beautiful colors of fall. I knew it wasn’t magic…. I learned the plants change color when they stop producing chlorophyll. Chlorophyll is the green substance in plants which interacts with sunlight throughout the warm seasons of spring and summer to make the food the plants need to grow, and which gives plants their green color. This process is called photosynthesis and it uses the energy from the sun to combine carbon dioxide and water into sugars. The change to cooler weather, shorter days and less sunlight in the fall tells the plants to stop growing and to begin storing the sugars in their roots for next year’s growth. This reduction in chlorophyll lets other pigment colors in the plants begin to show. The steadier, the more gentle the temperature change from the warmth of summer to the cold of winter allows the fall color to change more slowly and linger longer. However, once we’ve had a freeze, the chlorophyll breaks down faster and plant colors will start changing quickly. 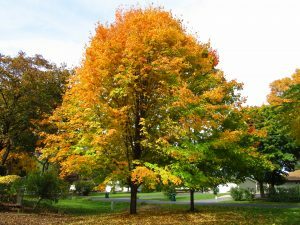 The Sugar Maple (Acer saccharum) turns an orange color at its peak in the fall. During a dry, sunny fall, the orange color appears a more brilliant reddish orange. I also found out weather conditions throughout the growing season and into the fall are what affects the brilliance of the colors we see. A drier summer typically means more vibrant colors, while a rainy summer typically means less vibrant, more drab looking colors. And, a dry fall with more sunshine produces the deeper red colors. Thanks for the quick review! Great to read!